When you need dependable appliance repair in Northwest Houston and beyond, AJ's Appliance Service & Repair has you covered. From refrigerator repair to washing machine repair and other home appliance repair services, there's no limit to our vast expertise. We're committed to providing our customers with quick turnaround times and top-quality workmanship! When your home appliances stop functioning at peak capacity, it can feel like your household instantly falls into chaos. Without the ability to easily wash your clothes, prepare meals, or clean up kitchen scraps, you’re likely to be left with a long list of chores and hours and hours of work ahead of you. Rather than give up such a big chunk of your time, call on the appliance repair professionals at AJ’s Appliance Service & Repair. We offer top-notch appliance repairs to homeowners in Northwest Houston and nearby areas. We specialize in fixing home appliances, and we are proud to offer appliance repair service for residential units in commercial spaces. 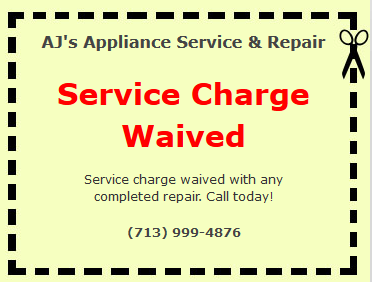 The next time the washing machine in your home malfunctions or the refrigerator in your office breaks down, call AJ’s Appliance Service & Repair right away! 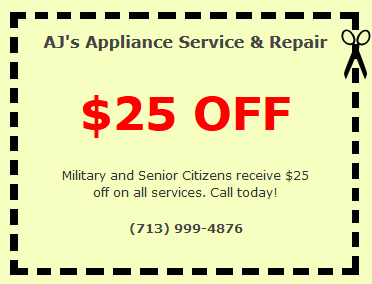 Located in Houston, AJ’s Appliance Service & Repair provides appliance repair service to residents throughout the area. We’re proud to extend our services to customers in Cypress, Katy, Jersey Village, Aldine, Addicks, North Houston, Westside, and environs. When you’re looking for appliance repair that won’t let you down, you can count on the unwavering commitment to customer satisfaction that you’ll find at AJ’s Appliance Service & Repair. Not only do we have over 25 years of experience in the industry, but we also offer a one-year parts warranty and a seven-year labor warranty on all the work that we do. No matter whether you come to us for oven repair, dryer repair, or other home appliance repair jobs, you can be certain that you’re getting top-quality appliances repair service that will stand the test of time. 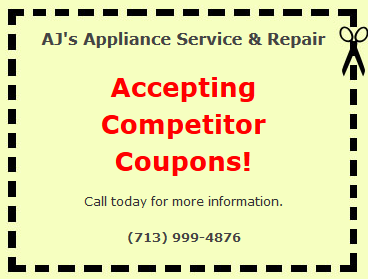 In addition to providing long-lasting appliance repair services, AJ’s Appliance Service & Repair also strives to offer some of the fastest service in the Northwest Houston area. As a family-owned appliance repair company, we know firsthand what it’s like to try to run a household without properly functioning appliances. To ensure that you don’t have to put up with this kind of stress, we aim to provide speedy yet precise appliance repair services each and every time. We even offer emergency services for refrigerator repair, so don’t hesitate to get in touch with us when one of your appliances is malfunctioning and you need help fast. We’re ready and willing to share our knowledge and expertise with you, so that troublesome appliance doesn’t upset your daily routine. For your peace of mind and security, AJ’s Appliance Service & Repair is fully insured and EPA certified to work with refrigerants. We’re here to bring you the high-quality appliance repairs you deserve to keep your home running strong, and we’ll gladly waive the service charge with any completed repair. Call us today to schedule an appointment or discuss your needs for appliance repair service with one of our knowledgeable technicians!